For better or for worse, National Service in Singapore has been culturally defined – and notoriously dismissed – as a gender-specific experience only local men at the prime of their youth can understand (and passionately lament about, depending on who will listen). Here’s the age-old narrative: when the Singaporean son turns 18, he’s forced to spend the last fragments of his teenage years serving the country. It’s a predestined rite of passage into adulthood, and the end of his two-year enlistment symbolises his coming of age. But what about his evolution as a human being beyond that? And what about the next decade of his life that’s disrupted every year he’s reactivated? 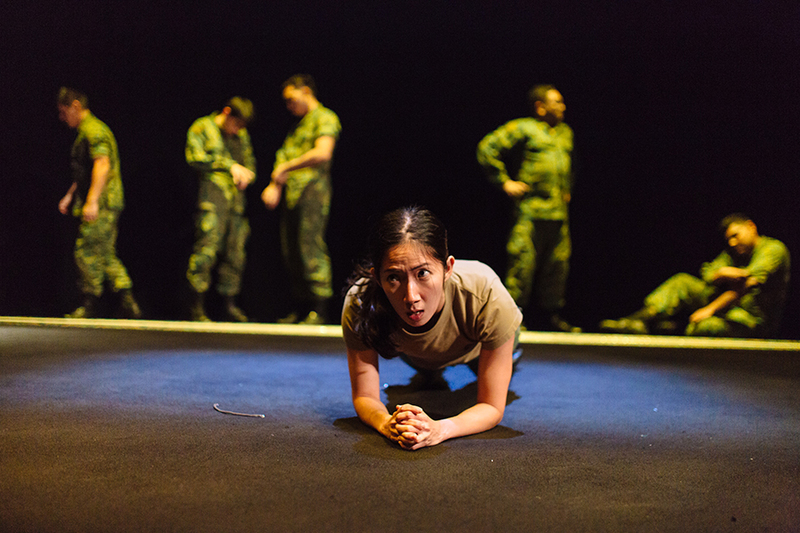 FRAGO by Checkpoint Theatre poignantly touches upon this very subject matter of reservist life. 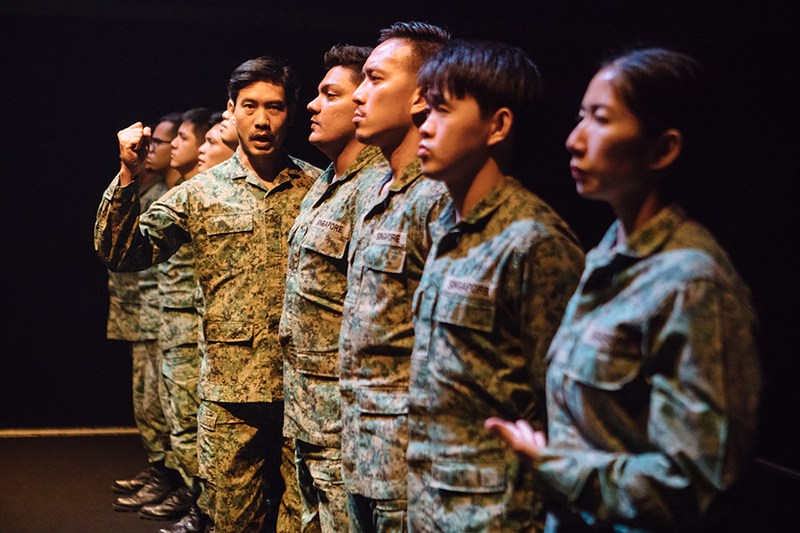 Written by Lucas Ho (read our interview with the talented playwright here) and directed by the visionary Huzir Sulaiman, the play sees a motley group of army mates who are recalled for their seventh year of reservist training. As military tradition dictates, this cycle requires them to partake in a highly-dreaded war game exercise. Instead of focusing on the task at hand, however, their thoughts drift from jungle warfare to the troubles of their everyday lives. Instantly, the inner realms of their preoccupied minds become the true setting for this brilliant production. Displaying his intimate understanding of reservist culture, Lucas triumphs beautifully in capturing the pains and complexities of adulthood through his script. Like a fly on the wall, we’re allowed to sit in as his thoughtfully-developed characters open up about their lives. They discuss the anxiety of being a new parent, the pressures of settling down, the logistical nightmare of moving into a new home, the pains of a demanding office job, and even the temptation to stray from monogamy. As a local male specimen on the cusp of turning 30, the honest writing will hit close to home. Under Huzir’s solid direction, the performances in FRAGO are a joy to watch. Even with the generous amounts of military jargons thrown around, you’ll never feel alienated from the play, thanks to how he ensures that the actors stay anchored in the humanity of their characters. Not one to shy away from making a political statement, Huzir also addresses the absence of minorities in the armoured infantry unit. In a move that shows how art doesn’t always imitate life, he engaged Malay and Indian actors to play the roles of certain Chinese reservist personnel. Why, you ask? Well, why not? What is a good script without an ensemble of actors to bring it to life? With FRAGO specifically, what’s truly commendable is the push-and-pull dynamics between the characters and how the actors effortlessly play off each other. 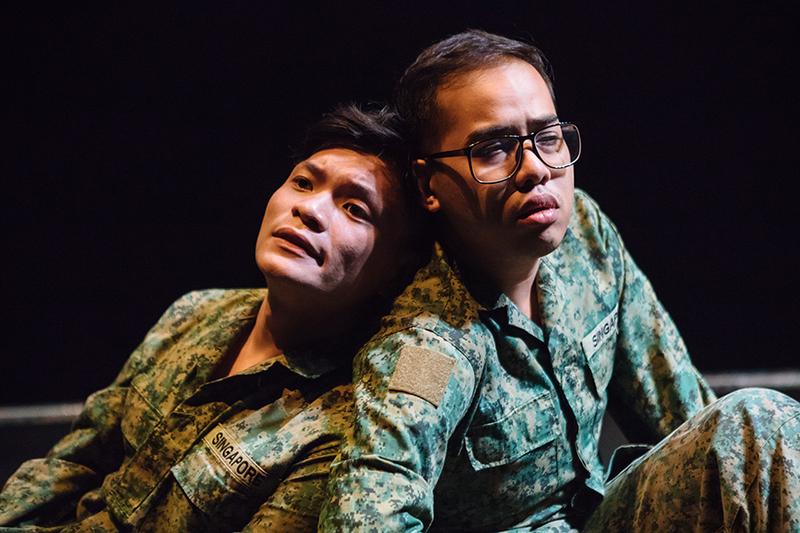 Every time Lieutenant Colonel Wong and Lieutenant Tan (played by Timothy Nga and Adib Kosnan) engage in hilarious dialogue, you get to explore the philosophical differences between a full-time soldier and reservist personnel (hint: one’s less enthusiastic). 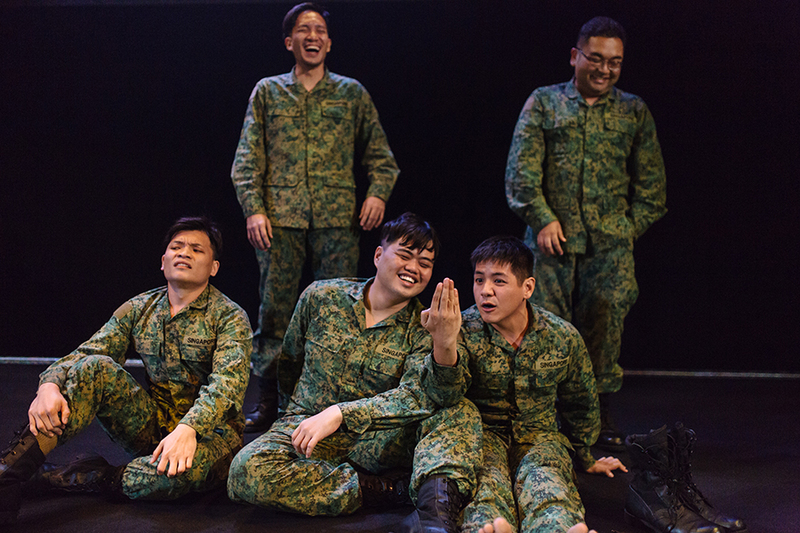 The witty banter between Corporal Feng and Lance Corporals Phua, Yun and Ong (played by Zaaki Nasir, Chong Woon Yong, Derrick Tay and Tan Sieow Ping respectively) will also leave you in stitches, reminding you that boys will be boys, even in their thirties. Pure comedic gold lies in the couple argument between David and Wan Qing (played by Alfred Loh and Cerys Ong). If you’ve been in a relationship where the nation-serving boyfriend is too tired to care, or had a highly emotional girlfriend who didn’t give you the time and space to breathe, this scene is dedicated to you. Adding a refreshing female perspective to this testosterone-fuelled universe is Warrant Officer Winnie Low, played by the compelling Jo Tan. In a beautiful yet melancholic scene towards the end of the play, we get to see how reservist is but a temporary disruption in a man’s life, yet it is a permanent way of life for full-timers like Low. As we learn about the circumstances that lead to the situation she’s in, we discover the more brutal realities of working as a civil servant. In those instances that inspire empathy, her gender is almost insignificant. If you think only local men who’s served in the army can appreciate FRAGO, you are gravely mistaken. While you won’t be spared the occasional male locker room chatter, Checkpoint Theatre has deconstructed this concept of masculinity and revealed multiple layers of the universal human experience. 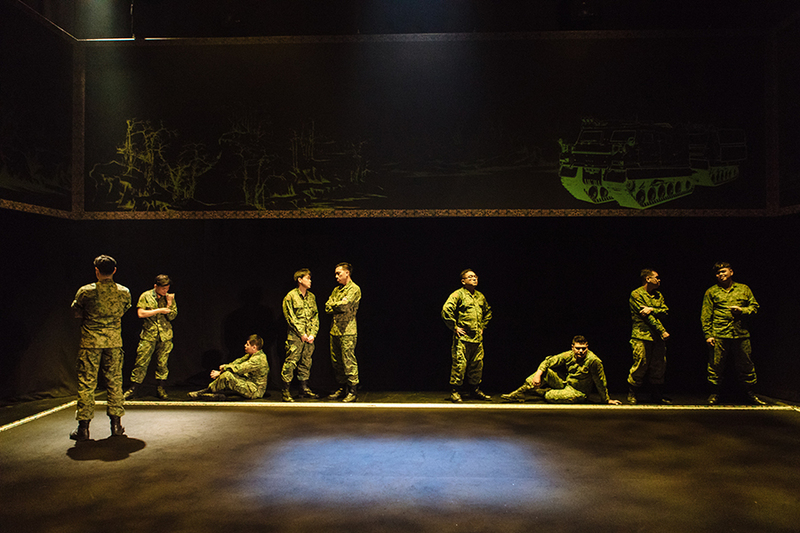 Whether it’s growing into your thirties, being worried about the future, or constantly assessing where you are in life, just look past the enormity of the play’s military facade and you’ll discover stories of joy, hope and fear that we all can identify with, man or woman. Well written review Arman! Cheers!